I have a Rundll error message that states: Error loading C:\Progra~1\MYWEBS~1\Bar\1.Bin\MWSBAR.dll. How can I fix that? There's a lot left unsaid in your question - like what system you're running on, what browser you use, and even when the error is happening. But, I'm going to make a few assumptions, and follow those up with a wild guess. First, "mwsbar.dll" is associated with the "My Web Search" toolbar which is downloaded and installed with several different free products. The first step is simple: go to Control Panel, Add or Remove Programs... and look for and uninstall "My Web Search Bar". It can actually be present under several different names, so look for any of the other items listed here. Even though My Web Search is not spyware, it's apparently flagged by some anti-spyware utilities. So my next recommendation is, of course, to make sure you're running a good, up-to-date spyware scan. Now, all of that probably assumes that things are working - and obviously, since you're getting an error message, something isn't quite right. Those steps may, or may not, clear up the problem. Our next step is to address the symptom. "IE has an often over-looked interface for dealing with 'Browser Helper Objects'." mwsbar.dll is what's called a "browser helper object" or BHO. It's something that's installed into Internet Explorer. I have to assume that that's what you are using, and that the error appears when you start IE. Fortunately, IE has an often over-looked interface for dealing with "Browser Helper Objects". The list of items therein will probably be quite different for you. Once you find it, click on it, then click on the Disable Setting below the list. Close the Add-on manager, close IE, and see if that didn't solve your problem. If it didn't (and you're sure that all instances of mwsbar.dll are removed from the Add-on manager), then the next step is to remove it manually. Rather than repeat someone else's work, I'll simply point you here: Fun Web Products "My Web Search" Removal Instructions and Help, which includes instructions to use the diagnostic tool HijackThis to remove the registry entries that relate to My Web Search. 2. Downloaded "HIJACKTHIS"...Found the offending line on the first pass...Deleted it in 2 seconds flat....First Class! I have Windows Xp, I read your article and did everything it said, I could not find the file in the Add/Remove program. Nor did I see it in my programs file. I tried the Internet Explorer Tools menu, I opened the Manage Add ons, I looked in every slot ("Show") and I did not see the "mwsbar.dll". I don't think it exsist in my pc but it's always giving me this: "ERROR FOUND C:\PROGRA~\MYWEBS~1\bar\1.bin\MWSBAR.DLL not found". I don't understand why it's still trying to exe. this file when it doesn't exist... Please Help! I have read all the articles on the subject of removing the spyware. I installed and ran Spybot. I deleted the BHO in "Manage Add On's" and I am still getting the same message on my start up screen: C:\Progrm~\mywebs~1\bar\4.bin\mwsbar.dll, Specified Module could not be found" The only difference I can see is that my message has a \4.bin\ in the line. What else can I do? I aslo meet this error "ERROR FOUND C:\PROGRA~\MYWEBS~1\bar\1.bin\MWSBAR.DLL not found". I follow your instruction, but I couldn't find "Manage Add-ons" on Tools menu. How can I fix this problem? Please help. Thanks. If you install the diagnostic tool Hijack this and run the search it will pull back a list just find the error you in this list, tick the box and remove. And hopeully your problems will be solved. Sorry what I meant to say was that you will need to find the error that you have in the list. Then click to the tick box on the left and then remove it. It worked for me. How do I get rid of C:\Program~1\mywebs~1\bar\4.bin\mwsbar.dll error during start-up of Xp windows. I went too IE Tools and mwsbar was not in the list of Add-ons. I have a Rundll error message that states: Error loading C:\Progra~1\MYWEBS~1\Bar\1.Bin\MWSBAR.dll. I followed the instructions, went to Add and Remove but none of the My Web Search pages are there.??????? CONTROL-f (find) mwsbar.dll and delete. When my computer finishes booting, I have a RUNDLL error come up on screen. My system is running XP with SP2. I have no idea where this comes from, hope you are able to help. I tried taking a screen shot of the fault, unfortunately couldn't paste it to this query. Most of you seem to be getting an error message because, in point of fact, you -don't- have that toolbar or its related products installed any longer. However, the computer likely has entries in an area known as the Registry, which tells the computer to load certain programs when you start up the computer. These entries which are still hidden away in your machine are what is causing the message to appear. It's looking for that program you no longer have, and, when it doesn't find it any longer, spits out that error message at you. As one or two others have mentioned, HijackThis will help you remove those entries from the Registry. Another way to find these entries is by using the MSCONFIG system utility. At the Run... command type: msconfig and hit then click on the tab that says 'Startup' and find any related entries in there and disable it. My computer had been acting strange soooo I did an antivirus scan on McAffe and they are he ones who had found this virus on my computer. I had copied the name and found the file and moved it to my desktop. Probably not the most smartest thing Ive done, but I had tried everything to alter it and failed. My computer will not let me delete it. So I had done some research on this and some of the websites say it is in your System Restore. I looked in the system restore and it will not go back to beyond the date of where this virus was picked up which was back in July. I tried to find MWSBAR.dll and it is not installed in Internet Explorer, anywhere that I can find on my computer. I am not able to remove it from add or remove programs because my computer can't find it. Help PLEASE!!! My OS is Windows 2000 Professional. 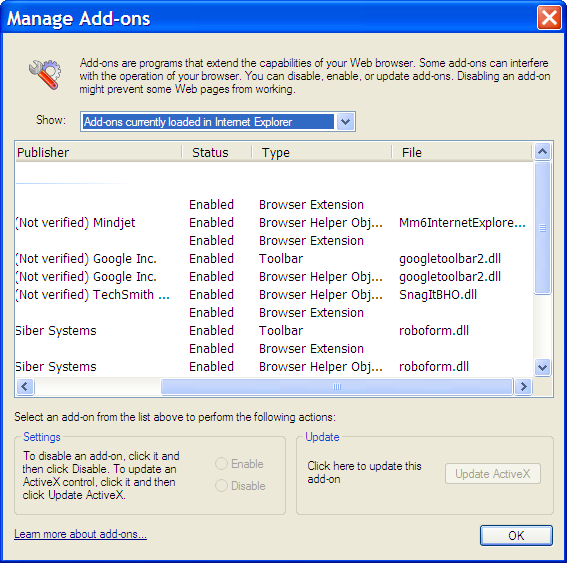 I can't locate Manage Add ons in the Internet Explorer Tools menu. It's not a function of the operating system, it's the version of IE you're using. 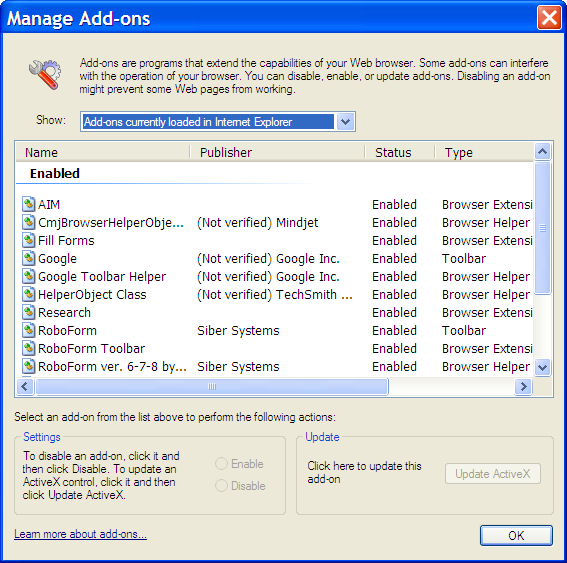 I believe the addon manager was added in IE 7. I have been at this for numerous days. I have tried adding ghost files with notepad, I have tried to use the registry editor, I have used CCleaner, I have tried manually removing the entries, I have used malware bits, I have installed spyware blaster, and a number of assorted other things including going into internet explorer and into the registry myself to remove registry entries, without success. I can remove everything associated with this mwsbar, but it keeps repopulating itself within nano seconds of being removed. There is some code somewhere which is calling for this thing which gives me the error message. I am at wits end and buggy from staring at this machine for so long. hi leo,Every time i start my laptop,i get a Rundll error message that states: Error loading C:\Progra~1\MYWEBS~1\Bar\1.Bin\MWSBAR.dll. How can I fix that? turn on.also i am specifying the details about my laptop.please,please reply.